He was an articulate scholar, a man of vision. He was a doctor of Judaic Law, a man on a divine mission. The Christians were persecuted in his formative years. The Sanhedrin and Pharisees were his greatest peers. Christianity was dealt a deathblow in Jerusalem. His persecution and slaughter caused fear and mayhem. He thought he would route them out on the outskirts of Judea. He didn’t count on the glorified Jesus being a major player. He set a course for his mission with a maniacal grin. His purpose was to preserve the old tradition. God had chosen him for this extraordinary mission. It was on the road to Damascus that he met the Lord. The blinding flash and image could not be ignored. There was an entrancing voice that Saul alone understood. He was thrown to the ground, shaken as anybody would. Saul opened his eyes and saw a figure resplendently bright. It was at this moment his heart was pierced by a penetrating light. A voice thundered “Saul why do you persecute me”. Even though he was blinded, he now could clearly see. Saul now completely disarmed; his hatred gave way to love. He now had a new mission divinely approved from above. Saul’s heart was changed, he now understood clearly. 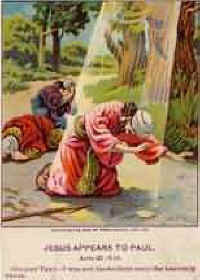 The Lord that he persecuted, he now loved dearly. This was the beginning of a new zeal for life. It would create for him much adventure and cause equal strife. He was resolute in his mission; it was clear and concise. Saul finally understood God’s purpose and became wise. An astonishing energy was released in him. For the first time, he was cleansed from every sin. The experience on that road completely enlightened Saul. From that moment in time he was the great apostle Paul.